Have you noticed a bunch "famous" Instagrammers posting pics with their highly used tumbler cups lately?! Well I have, and I have been dying to try one. I love to drink soda...Diet Coke, Dr. Pepper 10, Root Beer - you name it, I LOVE it! The perfect soda/drink to me is one that is as cold as possible. Stopping at McDonald's to get a drink is fine and dandy, but I don't like that the ice melts so fast and waters down my beloved soda. 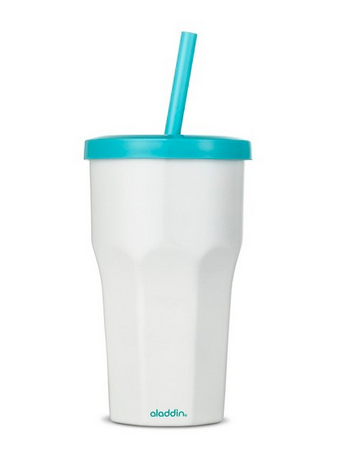 Luckily for all of us, Target has this amazing Aladdin Stainless Steel Tumbler on sale for only $5.58, reg $15.99! I've seen these baby's go for almost $40, so don't miss your chance to always have a cold beverage on hand for a fraction of the cost.